The ZagZig chair responds to your movements. Handcrafted in Detroit, and made from sustainably grown and harvested plywood, the ZagZig Chair is formaldehyde-free. Because each ZagZig Chair is made-to-order (shown in a clear low-sheen lacquer), it is available in a wide variety of custom colors & finishes. 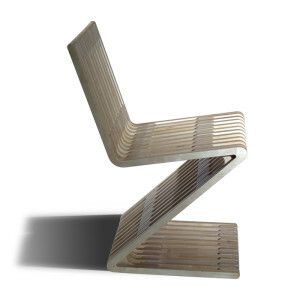 The ZagZig chair is a surprisingly comfortable piece of furniture due to the inherent springiness of the structure. Sit in it and it responds to your movements. 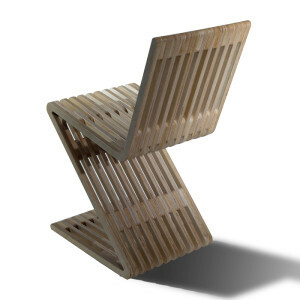 Whether you are rocking gently back and forth or side to side, or some combination of the two, this chair gently but firmly allows for movement. In fact, it is almost impossible to sit still in it; you just want to move! That’s part of the reason for its other name: The ADHD. 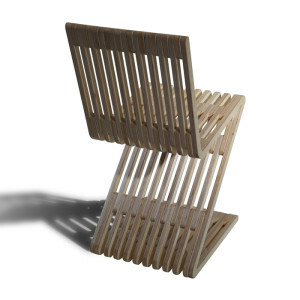 First made from solid elm wood by Gerrit Rietveld in 1934 and called the Zigzag chair, our version is constructed from 88 pieces of precisely machined Baltic birch plywood which are doweled, glued and nailed together. The pictured chair is finished in clear, low-sheen lacquer. A variety of other colors and finishes are available. We can also create a custom color, or custom match furniture you own, for an additional charge. 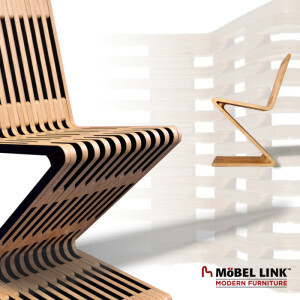 NOTE: The ZagZig chair has a weight limit of 250 lbs (114 kg).